Jennifer has only been a part of the eFulfillment Service (EFS) family since November 17, 2015, but has made quite an impression on management and her peers. Starting out as part of our order fulfillment team in the EFS pick/pack department, where she focused particularly on quality control, Jennifer was soon promoted on April 4th, 2016 to our Accounting Department as an Accounting Clerk. Jennifer proudly calls her childhood “amazing!” She grew up just outside of Sault St. Marie, Michigan as the youngest child in a very close family with six sisters and one brother. She and her siblings grew up on their family’s farm that was homestead 138 years ago. Her mom was a Secretary and Attendance Counselor at the local high school, while her dad worked at Michigan Bell (now AT&T). Jennifer’s grandparents lived right across the street from her, where they raised beef cattle/rabbits as well as other farm animals throughout the years. Jennifer fondly recalled the day her grandfather came over and called her sisters and brothers together and said, “I am only going to ask this once, who wants to have a horse?” Jennifer was the only one who rose her hand with great enthusiasm. This was a turning point for Jennifer; she was active in 4H where she rode her horses competitively. At 11 years old, she recalled thinking that she was the “richest person in the world” because she had earned over $800 competing in Speed & Action as well as Barrels & Poles! Jennifer maintained that competitive streak throughout her school days as part of the swim team and as a pompom girl. She was also President of the Student Council and part of DECA, where they prepare emerging leaders and entrepreneurs in marketing, finance, hospitality and management. Jennifer is currently engaged to a person named Chris, whom she has known since she was 12 years old. They reconnected 11 years ago by a chance meeting at a social gathering and have been together ever since. Chris and Jennifer raised three children. Chris has a 29 year old son, Jerome, who is in the Army stationed at Fort Louis, Washington, as a Computer Specialist. Jennifer has two sons: Matthew, 26, who lives close to his grandparents in the Upper Peninsula, and Douglas, 17, who lives at home. Chris and Jennifer made a decision to move to Traverse City three years ago for better opportunities for Douglas. Douglas suffers from a rare genetic disorder called Prader-Willi Syndrome (PWS). Individuals with PWS have physical, mental and behavioral problems, with the main one being an unrelenting feeling of hunger. Although he is developmentally-delayed, Douglas is an extremely compassionate and loving kid. While most parents dread the sound of their crying newborn, Jennifer was unable to experience this because Douglas was six months old before he made a single noise. While attending church service one Sunday, Douglas cried for the very first time. Then, Jennifer started crying herself. The minister stopped in the middle of his sermon to share Douglas’s story with the congregation; it was a beautiful moment! Douglas and Jennifer shared another wonderful experience last fall when he was selected by the N.E. 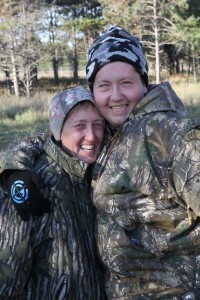 Chapter of the Safari Club International to attend a special wish hunt for special needs kids. The hunt, pictured above, happened last fall at the Jack Pines Safari Club, a private lodge & deer/elk ranch, in Lewiston, Michigan. There was a team of club members that decked him out in new equipment from head to toe, fed him, taught him how to hunt, and then sat with him in the hunting blind for several days until he shot a 9-point buck! Douglas later attended a banquet in his honor where they presented him a full head mount of his deer with photos and a video that were taken throughout his entire journey. They also presented Douglas with a two-day professional walleye trip on Lake Huron, which will happen later this year. Jennifer and Chris, who is the Culinary Manager at both the Traverse City and Glen Arbor locations of Cherry Republic, are very happy with their decision to move to the Traverse City area. When Jennifer and Chris are not working, they love to spend time with family, particularly out on the water, which makes them appreciate all the lakes of Northern Michigan. Here at EFS, we are very glad that they made the move to our area. Jennifer’s calming presence and attention-to-detail has made her a great asset to our order fulfillment company, and we love having her as part of our team!